My this week’s cocktail post began with me wondering – does one put actual tea in a LIT? Apparently no, when you check the recipes on the internet but I wanted to twist up this classic cocktail a bit. My favourite LIT is the one made in the TGIF in Mumbai. However, the bartender was very secretive and refused to give me his recipe. So I mentally put him on my hit list and moved on to making my own favourite LIT. 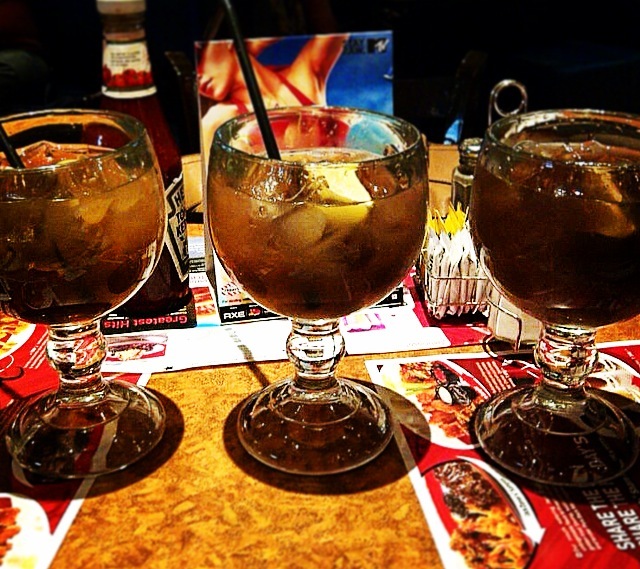 Long Island Iced Tea at TGIF. Did you know that there are different kinds? There is actually something called a – wait for it – a Bullfrog. Yes, its also blue in colour. My first reaction to seeing this drink was ‘you are so pretty ‘! So let me begin with a basic Long Island Iced Tea and I will specify the differences when making a ‘Bullfrog’. 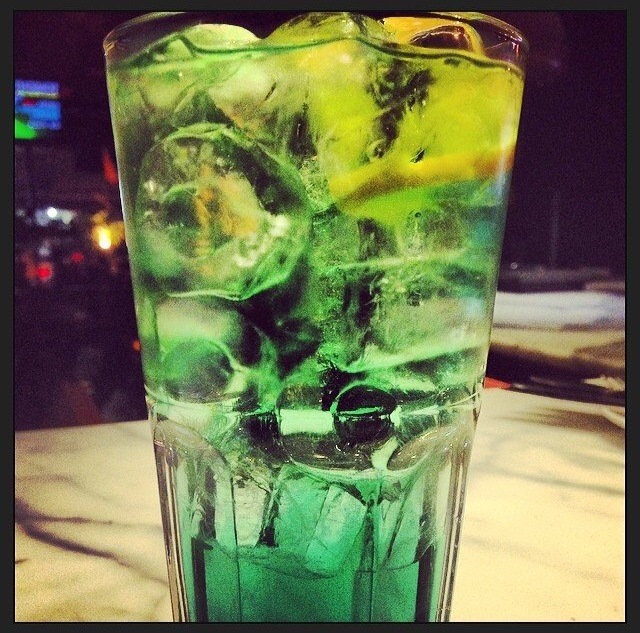 (This drink is not for the faint hearted). 7. Coca-cola as according to ones preference. For a Bullfrog, instead of Coca Cola, Sprite is required and no tea bag is needed. Mint leaves (because I like them). • Pour the different alcohol in a glass. 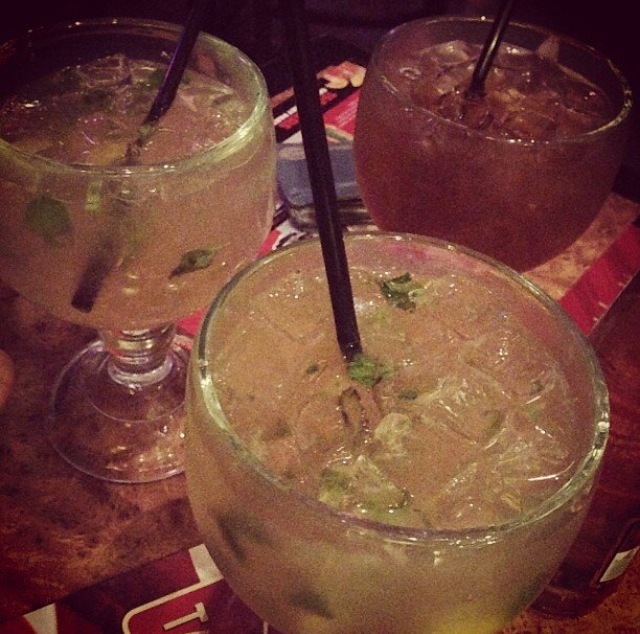 Make it a large glass. • Put in the mint leaves. • Add the Sweet and Sour mix. • Next goes the actual tea – 30 ml of black liquor tea. • Top up the glass with ice. • The Coca Cola goes in next – the requirement may vary from person to person depending on how strong one likes their drink. • Throw in the lime slices. • Add the cut fruits from top. • Give it a good stir. Just a warning – two of these should be good enough for a crazy night in! ahead and give you a shout out from Austin Texas! Just wanted to say keep up the excellent job!